Free energy principles from the past. Nikola Tesla, now available in the books by Walters (1961) and Cheney (1981). He is the one individual responsible for creating the entire alternating current network that powers the world today. He defied the science of his day and designed and built the AC generator that transforms “potential” energy into “electrical” energy. Yet, he is not in many school texts, and his basic theories and ideas for larger projects and applications were nearly lost to the world. Why was he not supported? Why is Thomas Edison such a well-known name and Nikola Tesla is not? Why was his research not actively continued? Why does the academic community, within the U.S, not only continually ignore the possible applications of his theories but ridicule them? The lack of a follow-up? Fear of change is not an adequate excuse for not actively pursuing the development of our full capabilities as human beings, as individuals or as groups. Back to Tesla: Nikola Tesla had perhaps thousands of other ideas and inventions that remain unreleased. A look at his hundreds of patents shows a glimpse of the scope he intended to offer. If you feel that the additional technical and scientific research of Nikola Tesla should be revealed for public scrutiny and discussion, instead of suppressed by big industry. However, the inventions were not totally lost on everybody but now widely used in other locations like Dulce. According to whistleblowers, Dulce and other related complexes as Antarctica are real Tesla worlds. The joint secrete aliens/government base known as dulce, area 51 and others use magnetics for EVERYTHING! They use magnetics as the basic structure for their energy source. A reel Tesla world. Tesla was the world’s greatest inventor and include free energy from space. His inventions were stolen, boycotted by the big electric and the telegraph companies, by the banks and finally poisoned. The more you learn about magnetics, the better. The Human Race calls them ‘magnets’, the Aliens call them ‘lodestar’. They have been harvesting lodestars [lodestones] for centuries. Not only that, they want ALL the magnetic power on Earth. The magnets are used to pull energy out of the vacuum and work as an aerial. The aliens present at the different location around the world or better in our world. They intend to continue harvesting that power, now and in the future. As long as we were only using magnetic power as an oddity, there was no problem. But in recent times, the human race has begun using magnetic power and finding more ways to utilize that commodity. There was a treaty made. In the original treaty, the human race (or those who supposedly ‘represented’ the human race, if you could call it. As people searched for another source of power, we turned to magnetic. The aliens wanted a new treaty. What could we offer? They chose to land, underground mining rights, animals and humans for new experiments. The general public NEVER KNEW about the treaty. The governmental heads of the world chose another treaty in 1933. This time ‘we’ got high-tech knowledge in exchange. So now, the more we use magnetics, the more they claim humans, and the lands of the U.S.A. We were ‘sold’ in exchange for magnets. If you doubt it, look around — there are token companies that ‘really’ utilize magnetic power, but are depending on electric based or ceramic magnets, made from lodestar. It is important to Join the world’s call to tell power brokers everywhere that we are now ready to Occupy Energy and learn about what our universe really has to offer and will do so without them. The release of Nikola Tesla’s technical and scientific research — specifically his research into harnessing electricity from the ionosphere at a facility called Wardenclyffe — is a necessary step toward true freedom of information. Back to Tesla one of several inventors, I would like to introduce you too. First, the definition of free energy. Free energy is the ability to converts an at that stage unknown form of natural wireless energy into electricity by Nikolai Tesla. He tried to hand to humanity and the world free energy, Tesla developed components of technology whereby that could be accomplished. Tesla was a physicist, inventor, and electrical engineer and not only of unusual intellectual brilliance but also the practical achievement. A Serb descent and but most of his work was conducted in the United States. Tesla’s investors dropped the project when they realized there was no way to meter the power to make money on the end user. Now one hundred years later We are trying to catch up and are still far behind compared where he was with his understanding of radiant energy and the information about removed by the State of America. In 100% of these cases as mentioned above the engineering principles involved have been misunderstood by faculties who even at present continue to class them as “crackpot” science despite being used in secret installations and the military instead of new discoveries. The simple reason- Faculties or academics have long thought that these “type of devices” were “creating energy out of nothing”. They did not understand or realize that we live in a world full of energy, everything is energy and an open system. SPECIFICATION forming part of Letters Patent No. 685,958 dated November 5, 1901. Application filed March 21, 1901. Serial No. 52,154. (No model.) To all whom it may concern: Be it known that I, NIKOLA TESLA, a citizen of the United States, residing at the borough of Manhattan, in the city, county, and State of New York, have invented certain new and useful Improvements in Methods of Utilizing Radiant Energy, of which the following is a specification, reference being had to the drawings accompanying and forming a part of the same. It is well known that certain radiations—such as those of ultra-violet light, cathodic, Roentgen rays, or the like—possess the property of charging and discharging conductors of electricity, the discharge being particularly noticeable when the conductor upon which the rays impinge is negatively electrified. These radiations are generally considered to be ether vibrations of extremely small wavelengths, and an explanation of the phenomena noted it has been assumed by some authorities that they ionize or render conducting the atmosphere through which they are propagated. My own experiments and observations, however, lead me to conclusions more in accord with the theory heretofore advanced by me that sources of such radiant energy throw off with great velocity minute particles of matter which are strongly electrified, and therefore capable of charging an electrical conductor, or even if not so many at any rate discharge an electrified conductor either by carrying off bodily its charge or otherwise. My present application is based upon a discovery which I have made that when rays or radiations of the above kind are permitted to fall upon an insulated conducting body connected to one of the terminals of a condenser, while the other terminal of the same is made by independent means to receive or to carry away electricity, a current flows into the condenser so long as the insulated body is exposed to the rays, and under the conditions hereinafter specified an indefinite accumulation of electrical energy in the condenser takes place. This energy after a suitable time interval, during which the rays are allowed to act, may manifest itself in a powerful discharge, which may be utilized for the operation or control of mechanical or electrical devices or rendered useful in many other ways. In applying my discovery I provide a condenser, preferably of considerable electrostatic capacity, and connect one of its terminals to an insulated metal plate or other conducting body exposed to the rays or streams of radiant matter. It is very important, particularly in view of the fact that electrical energy is generally supplied at a very slow rate to the condenser, to construct the same with the greatest care. I use by preference the best quality of mica as a dielectric, taking every possible precaution in insulating the armatures so that the instrument may withstand great electrical pressures without leaking and may leave no perceptible electrification when discharging instantaneously. In practice, I have found that the best results are obtained with condensers treated in the manner described in a patent granted to me February 23, 1897, No. 577,671. Obviously, the above precautions should be the more rigorously observed the slower the rate of charging and the smaller the time interval during which the energy is allowed to accumulate in the condenser. The insulated plate or conducting body should present as large a surface as practicable to the rays or streams of matter, I have ascertained that the amount of energy conveyed to it per unit of time is under otherwise identical conditions proportionate to the area exposed, or nearly so. Furthermore, the surface should be clean and preferably highly polished or amalgamated. The second terminal or armature of the condenser may be connected to one of the poles of a battery or other source of electricity or to any conducting body or object whatever of such properties or so conditioned that by its means electricity of the required sign will be supplied to the terminal. 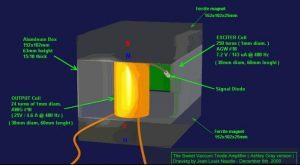 A simple way of supplying positive or negative electricity to the terminal is to connect the same either to an insulated conductor, supported at some height in the atmosphere or to a grounded conductor, the former, as is well known, furnishing positive and the latter negative electricity. As the rays or supposed streams of matter generally convey a positive charge to the first condenser-terminal, which is connected to the plate or conductor above mentioned, I usually connect the second terminal of the condenser to the ground, this being the most convenient way of obtaining negative electricity, dispensing with the necessity of providing an artificial source. In order to utilize for any useful purpose the energy accumulated in the condenser, I furthermore connect to the terminals of the same a circuit including an instrument or apparatus which it is desired to operate and another instrument or device for alternately closing and opening the circuit. This latter may be any form of circuit-controller, with fixed or movable parts or electrodes, which may be actuated either by the stored energy or by independent means. The rays or radiations which are to be utilized for the operation of the apparatus above described in general terms may be derived from a natural source, as the sun, or may be artificially produced by such means, for example, as an arc-lamp, a Roentgen tube, and the like, and they may be employed for a great variety of useful purposes. My discovery will be more fully understood from the following detailed description and annexed drawings, to which reference is now made, and in which— Figure 1 is a diagram showing typical forms of the devices or elements as arranged and connected in applying the method for the operation of a mechanical contrivance or instrument solely by the energy stored; and Fig. 2 is a diagrammatical representation of a modified arrangement suitable for special purposes, with a circuit-controller actuated by independent means. Referring to Fig. 1, C is the condenser, P the insulated plate or conducting body, which is exposed to the rays, and P’ another plate or conductor, all being joined in series, as shown. 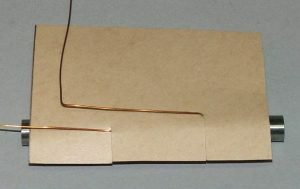 The terminals T T’ of the condenser are also connected to a circuit including a receiver R, which is to be operated, and a circuit-controlling device d, which in this case is composed of two very thin conducting-plates tt’, placed in close proximity and very mobile, either by reason of extreme flexibility or owing to the character of their support. To improve their action, they should be enclosed in a receptacle from which the air may be exhausted. The receiver R is shown as consisting of an electromagnet M, a movable armature a, a retractile spring b, and a ratchet-wheel w, provided with a spring-pawl r, which is pivoted to armature a, as illustrated. The apparatus is arranged as shown, it will be found that when the radiations of the sun or of any other source capable of producing the effects before described fall upon the plate P an accumulation of electrical energy in the condenser C will result. This phenomenon, I believe, is best explained as follows: The sun, as well as other sources of radiant energy, throw off minute particles of matter positively electrified, which, impinging upon the plate P, communicate an electrical charge to the same. The opposite terminal of the condenser being connected to the ground, which may be considered as a vast reservoir of negative electricity, a feeble current flows continuously into the condenser, and inasmuch as these supposed particles are of an inconceivably small radius of curvature, and consequently charged to a relatively very high potential, this charging of the condenser may continue, as I have found in practice, almost indefinitely, even to the point of rupturing the dielectric. Obviously, whatever circuit-controller be employed it should operate to close the circuit in which it is included when the potential in the condenser has reached the desired magnitude. Thus in Fig. 2 when the electrical pressure at the terminals T T’ rises to a certain predetermined value the plates t t’, attracting each other, close the circuit connected to the terminals. This permits a flow of current which energizes the magnet M, causing it to draw down the armature a and impart a partial rotation to the ratchet-wheel w. As the current ceases the armature is retracted by the spring b without, however, moving the wheel w. With the stoppage of the current the plates t t’ cease to be attracted and separate, thus restoring the circuit to its original condition. Many useful applications of this method of utilizing the radiations emanating from the sun or other source and many ways of carrying out the same will at once suggest themselves from the above description. By way of illustration, a modified arrangement is shown in Fig. 2, in which the source S of radiant energy is a special form of Roentgen tube devised by me having but one terminal k, generally of aluminum, in the form of half a sphere with a plain polished surface on the front side, from which the streams are thrown off. It may be excited by attaching it to one of the terminals of any generator of sufficiently-high electromotive force; but whatever apparatus be used it is important that the tube is exhausted to a high degree, as otherwise, it might prove entirely ineffective. The working or discharge circuit connected to the terminals T T’ of the condenser includes in this case the primary p of a transformer and a circuit-controller comprising a fixed terminal or brush t and a movable terminal t’ in the shape of a wheel with conducting and insulating segments which may be rotated at an arbitrary speed by any suitable means. In inductive relation to the primary wire or coil p is a secondary s, usually of a much greater number of turns, to the ends of which is connected a receiver R. The terminals of the condenser being connected as indicated, one to an insulated plate P and the other to a grounded plate P’, when the tube S is excited rays or streams of matter are emitted from the same, which convey a positive charge to the plate P and condenser-terminal T, while terminal T’ is continuously receiving negative electricity from the plate P’. This, as before explained, results in an accumulation of electrical energy in the condenser, which goes on as long as the circuit including the primary p is interrupted. Whenever the circuit is closed, owing to the rotation of the terminal t’, the stored energy is discharged through the primary p, thus giving rise in the secondary s to induced currents which operate the receiver R. It is clear from what has been stated above that if the terminal T’ is connected to a plate supplying positive instead of negative electricity the rays should convey negative electricity to plate P. The source S may be any form of Roentgen or Lenard tube; but it is obvious from the theory of action that in order to be very effective the electrical impulses exciting it should be wholly or at least preponderatingly of one sign. If ordinary symmetrical alternating currents are employed, provision should be made for allowing the rays to fall upon the plate P only during those periods when they are productive of the desired result. Evidently, if the radiations of the source are stopped or intercepted or their intensity varied in any manner, as by periodically interrupting or rhythmically varying the current exciting the source, there will be corresponding changes in the action upon the receiver R, and thus signals may be transmitted and many other useful effects produced. Furthermore, it will be understood that any form of circuit-closer which will respond to or be set in operation when a predetermined amount of energy is stored in the condenser may be used in lieu of the device specifically described with reference to Fig. 1, and also that the special details of construction and arrangement of the several parts of the apparatus may be very greatly varied without departure from the invention. 1. The method of utilizing radiant energy, which consists in charging one of the armatures of a condenser by rays or radiations, and the other armature by independent means, and discharging the condenser through a suitable receiver, as set forth. 2. The method of utilizing radiant energy, which consists in simultaneously charging a condenser by means of rays or radiations and an independent source of electrical energy, and discharging the condenser through a suitable receiver, as set forth. 3. The method of utilizing radiant energy, which consists in charging one of the armatures of a condenser by rays or radiations, and the other by independent means, controlling the action or effect of said rays or radiations and discharging the condenser through a suitable receiver, as set forth. 4. The method of utilizing radiant energy, which consists in charging one of the armatures of a condenser by rays or radiations and the other by independent means, varying the intensity of the said rays or radiations and periodically discharging the condenser through a suitable receiver, as set forth. 5. The method of utilizing radiant energy, which consists in directing upon an elevated conductor, connected to one of the armatures of a condenser, rays or radiations capable of positively electrifying the same, carrying off electricity from the other armature by connecting the same with the ground, and discharging the accumulated energy through a suitable receiver, as set forth. 6. The method of utilizing radiant energy, which consists in charging one of the armatures of a condenser by rays or radiations, and the other by independent means, and effecting by the automatic discharge of the accumulated energy the operation or control of a suitable receiver, as set forth. NIKOLA TESLA. Witnesses: M. LAWSON DYER, RICHARD DONOVAN. Stress again; First the use of Rontgen or Lenard tube to activate this electrically isolated plate. Prior to and during WW2 copper wire was isolated using a barium coating and barium was used because of its property to lower wire resistance. What most do not realize the barium contains not only many isotopes but also traces of Radium. It is considered safe but this might be an accelerator part of these devices. In case of Hans Coler he was not aware of it and used the material requested and supplied, probably wire with a ceramic coating. Barium found in the Earth’s crust is a mixture of seven primordial nuclides, barium-130, 132, and 134 through 138. In total, barium has about 50 known isotopes, ranging in mass between 114 and 153. The most stable metastable isotope is barium-133 with a half-life of approximately 10.51 years. Five other isotopes have half-lives longer than a day. Barium also has 10 meta states, out of which barium-133m1 is the most stable with a half-life of about 39 hours.Barium-130 undergoes very slow radioactive decay to xenon-130 by double beta plus decay, and barium-132 theoretically decays like xenon-132, with half-lives a thousand times greater than the age of the Universe. The abundance is ~0.1% that of natural barium. The radioactivity of these isotopes is so weak that they pose no danger to life. Of the stable isotopes, barium-138 composes 71.7% of all barium, and the lighter the isotope, the less abundant. Again, standing waves are used and the Tesla generating system. (I am talking here about Tesla’s method of wireless electric transmission, not the Schappeller device but they apparently have similarities.) The waves can be made to cross each other anywhere on the earth or on the other side of the earth. At the points of the standing wave, where there is no motion, (scalar wave), electrical energy can be received using an antenna. This is ultra-low-frequency energy, ELF waves. A very long antenna is necessary. The interesting thing and not said elsewhere until this report is that Tesla’s low-frequency waves 6-9 Hz, the frequency of the Schappeller device, and the world famous Schumann Resonance are all the same thing. The earth is used as a storage device since it is already in vibration at 6-9Hz. The vibration of resonance of essential of working the next device Being the Hans Coler over-unity device. Hans Coler over-unity device. The History and background of this invention listed as being Willi von Unruh and Hans Coler. It started in 1920 and with two different solid-state energy generators. The M machine ( Magnetstromgerate) and the S machine or Stromererzeuger which would produce a much higher load.For the 3 first time demonstrated in Berlin 1920 and able to power five 1000 candle lights and was powered by a small Leclanche cell. Based on the description now also assumed to be the same in the invention as claimed by Norrby and as such demonstrated too. During the demonstration in Berlin Unruh claimed that the excess energy came from splitting atoms and was pilloried for it by the scientific community. No one could prove him wrong but still did find himself in Jail. Has to do with the failure of the Science community; basically, the physical nature and dimensional of charge are neither understood nor established in existing physics. In part, this is due to the opaque relationship between mass and charge, with the former being attributed to the charge-carrier and the latter often treated as a property distinct or separable from the rest energy of the carrier. A solid-state magnetic generator was invented by Captain Hans Coler of Germany and a 10-watt example first shown in 1925. It involved magnets to generate electricity and employed a small battery but no other source of input power other than what he called space energy of Nature’s quantum invisible world. It was initially denied patent protection by the German Patent Office as being a perpetual motion device. For the time being, it was ignored, and the records relating to it were buried in hidden archives, possibly because the scientists who had to pass judgment could not understand the physical reason why the invention actually worked and did look at it as a hoax. Because scientist cannot understand it and reject it for that reason alone. German archives show that Unruh and Coler were working together by 1925 demonstrating their 10-watt machine. Managed to get it studies by three professors with a positive recommendation. W.O Schumann, M. Kloss, R.Franke. During 1933 Unruh and Coler did build a 70-watt machine and in 1937 a 6 kwatt one. It did power the house of Hans Coler for 3 years but lost to a direct hit by a bomb during WWII. There where two investors involved and did result in some wrangling after the war. While Coler’s Magnetstromapparat did not give the Kriegsmarine a gravitic “free energy” battery for their U-boats, the SS Technical Branch E-IV took possession of the patent, and turned it into a Converter for the Haunebu series of disc aircraft which was incorporated along with several Van de Graaf band generators and a Marconi Dynamo filled with mercury, all of which enabled the craft to reduce mass and produce power for the electromagnetic-gravitic Thule Tachyonator 7 Triebwerk. Now there comes another big surprise, according to whistleblowers from Dulce, used there and other locations to supply the necessary electrical energy. All power at the base is created using an advanced system originally created by German scientists following WW2. Probably an advanced Han’s Coler’s “Free Energy” Generators. The system uses large hexagonal circuits containing magnets and coils to generate energy from what is essentially nothing. In the devices mentioned above ferric magnets where used and from the insider leakage of information do know that the main aliens present in Dulce have been collection natural magnets known as lodestone. Nothing is known about any special treatment prior to use and processing to use in the energy generating device. The natural variants are less stable than the artificial produced once but that could also be an advantage if the assumed origin of energy as mentioned by Unruh would be the source. The energy production does only take place after the system starts resonating and is a problem. The natural magnets made from lodestone will resonate much easier/faster due to being present in the earth crust. Another device is the Moray and the Hubbard coil. The Moray Device and the Hubbard Coil were Nuclear Batteries according to Paul Brown, Collected Research Monographs, Vol. 1 Cadake Industries, 1987. The natural radioactive decay elements emit three primary forms of radiation; alpha, beta, and gamma. Alpha par-tickles are helium nuclei or helium ions consisting of 2 protons and 2 neutrons giving them a mass number of 4 and each alpha particle carries two positive charges. Beta particles, on the other hand, are high-speed electrons meaning that each beta carries a single negative charge. Gamma rays are photons and consequently, there is no need to discuss them here. An alpha or a beta particle in motion constitutes a current element. Several charged particles in motion is an electric current and are measured in amps. What he trying to tell you is that alpha and beta radiation is a naturally and electrical phenomenon but these radiations have no polarity. Natural radioactivity is emitted in all directions so that you end up with no net current or voltage. The object of a nuclear battery is to provide polarity to these emissions to achieve an electric current. As the particles are absorbed, the velocity goes to zero and the magnetic field collapses, yielding a variety of flux to produce an emf in an induction coil. Now, the amount of power contained in these particles is phenomenal. A charged particle in motion carries with it a magnetic field of a magnitude determined by the particles charge and velocity. Energy is stored in this magnetic field and is released as the particle is slowed or absorbed. The opposite principle of accelerating a particle by pumping energy into it. For instance, an alpha particle traveling at 67% the speed of light is absorbed in 6 mil of copper; the energy produced during this absorption is equivalent to 10 watts. Granted, this is 10 watts for only a microsecond, but if you are using a 1 curie alpha source then you are now talking about 37 billion alpha particles per second. Madame Curie is quoted as saying “The complete transformation of a gram of radium into a lead, produces about 100,000 times more energy than the combustion of one gram of hydrogen.” And Ernst Rutherford said, “one pound of radium would radiate energy at the rate of 10,000 horsepower.” Hopefully, it is now obvious to you that the energy content of radium is enormous. He then starts to explain the working of The Moray Device and the Hubbard Coil. He points out that the use of radium is common to both of the devices in our discussion. I will briefly interrupt to point to another aspect and difficulty to trigger some of these free energy devices. Prior to and during WW2 copper wire was isolated using a barium coating and barium was used because of its property to lower wire resistance. What most do not realize the barium contains not only many isotopes but also traces of Radium. It is considered safe but this might be an accelerator part of these devices. In case of Hans Coler, he was not aware of it and used the material requested and probably wire with a ceramic coating instead. Barium found in the Earth’s crust is a mixture of seven primordial nuclides, barium-130, 132, and 134 through 138. In total, barium has about 50 known isotopes, ranging in mass between 114 and 153. The most stable metastable isotope is barium-133 with a half-life of approximately 10.51 years. Five other isotopes have half-lives longer than a day. Barium also has 10 meta states, out of which barium-133m1 is the most stable with a half-life of about 39 hours.Barium-130 undergoes very slow radioactive decay to xenon-130 by double beta plus decay, and barium-132 theoretically decays like xenon-132, with half-lives a thousand times greater than the age of the Universe. The abundance is ~0.1% that of natural barium. The radioactivity of these isotopes is so weak that they pose no danger to life. Of the stable isotopes, barium-138 composes 71.7% of all barium, and the lighter the isotope, the less abundant. Let’s look at conventional nuclear batteries and see how they convert alpha and beta decay into electricity. But first, I should tell you about how exposure to these radiations alters the dynamics of an electric circuit. A conductor exposed to these radiations has its resistance reduced and its conductivity increased while dielectrics become partial conductors and their conductivity is not described by Ohm’s Law. These characteristics have been known by the scientific community since 1903. In addition to that, in 1916 it was shown that by using a weak solution of radium in conjunction with radio aerials near the antenna or tuning coil greatly increased the receptivity of the radio, even in circumstances where no stations could be received before. Most of these phenomena are explained by looking at the atomic scale to see what happens as a particle is absorbed. For an alpha particle being absorbed in copper, the panicles traveling at a high rate of speed and has a large amount of kinetic energy which is transferred to the electrons of the copper by the collision. The alpha produces some 86,000 ions before being absorbed. These ions are then free electrons in the conductor in addition to those normally present. This process is called the Multiplication Factor of the cell. That is because for every incident beta particle you get say 20,000 electrons. Conventional nuclear batteries are composed of cells of several types. looking at the basic four. The commonly known beta cell as first demonstrated by Mosely in 1913, was a beta source sitting on a feedthrough insulator at the center of an evacuated conductive sphere. As a beta particle leaves the source, it gives the source a net positive charge and as this beta particle is absorbed by the sphere it contributes a negative charge to this electrode. Further charges increase the difference in potential and current may be drawn from this to a load in the usual manner. An alpha source may be substituted by the principle remains the same. This is the beta or alpha voltaic effect and batteries of this type have been built as large as 2,000 watts that could fit into the palm of your hand. The contact potential difference cell or a class 2 nuclear battery: Simply put, this is a conventional battery composed of a stack of plates composed of materials with different work functions only no electrolyte is used. Instead, we immerse the plates in a radioactive gas. The life of all nuclear batteries is proportional to the half-life of the source material used. For radium, the half-life is 1,600 years. The advantage of this type of cell over the beta cell is its multiplication factor. One high energy beta particle ionizes many gas molecules before it is finally stopped. Each of these new charged particles is effective in placing a charge on the electrodes. Cells of this class commonly have multiplication factors of about 200. The third type is the class 3 P-N junction cell. By simply exposing a p-n junction transistor to alpha or beta bombardment, the transistor produces power to drive a load. Cells of this type have multiplication factors in the realm of 200,000 times. And finally, the thermo-junction type or radioisotope thermo-electric generator commonly called the RTG. This is the most dependable and the least efficient type of cell. Radioactive source materials are hotter than their surroundings due to the self-absorption of particles. By simply placing a thermocouple in the vicinity of this heat source, the energy is converted into electricity. Cells of this type operate at only about 20% efficiency but Voyager is equipped with an RTG. I believe the simplest type of nuclear battery is the class B type. Simply put, the device is a radioactive wire. Using a conventional battery and load utilizing a radioactive wire to complete the circuit. As current is drawn from the battery, it is amplified so that the full load current is not drawn from the battery. If you wind a transformer utilizing radioactive wire, the transformer acts as a current amplifier. This patent is closely related to the Hubbard coil. The McElrath patent; a cold cathode vacuum tube nuclear battery. This application was filed in 1931. I believe if Moray ever filed for the patent, he must have had a conflict with this patent. The success of these three inventors’ devices can be attributed to the work of Franz Kalusa and Oskar Kline in the first few decades of the twentieth century. 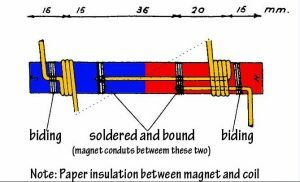 By using “twin bi-filar wound coils over permanent magnets,” it is believed that the Sweet VTA, Swiss M-L converters, and Coler Magnetstromapparat utilize the same principle to acquire free energy. The coils are thought to cancel out the magnetic field that “the normal, excited EMF flow” causes. This allows the magnetism from the stack of permanent magnets to be directed into the 5th and 6th dimensions, which are “‘ curled up’ within the other four dimensions,” according to Kalusa. The magnets are then allowed to freely tap the space energy in those dimensions while the coil continues to distract the normal magnetic field, so to speak. The Sweet VTA is slightly different than the other two devices, in that “it uses special conditioned or activated permanent magnet material.” It is therefore considered a “Stand-alone device.” This conditioning of the magnets is considered “the secret to the machine,” since it could “be just as well ‘told’ to output 50 HZ or 400 HZ.” When the theory behind the source of free energy that runs these three devices was originally postulated, Einstein rejected it. Eventually, he accepted the idea and allowed it to be published by the Prussian Science Academy. Floyd’s homespun experiments with the Vacuum Triode Amplifier apparently tapped some very interesting forces. During one test in his apartment, the VTA actually weighed less and less the more that was applied to the load. In other words, the more “negative energy” generated, the more anti-gravity observed. At a certain point, a frighteningly loud sound jolted the inventor, and that particular experiment was forever retired. A recurring theme in other experiments is a decrease in temperature of the Sweet VTA. Sometimes the magnets and coils measure as much as 20 F below air temperature when the device is powering loads of over one kilowatt. Once when the wiring was accidentally shorted, a “brilliant flash” appeared and frost was observed on the wires. Sweet was even electrocuted by his device once, which appeared to freeze the skin through which the current passed, and he believes that it was more damaging than a shock from the conventional voltage in a power line would be. Bearden calls the simultaneous cooling of the device and heating of what it powers “Gravito Striction.” Similar reports of energy machine components that exhibit below-ambient temperatures have been observed by other inventors, such as John Bedini and John R.R. Searl. A theory that could explain this effect has been postulated by Victor Schauberger, Walter Russell, and other researchers. They think “nature uses two types of ‘spin,’ one clockwise, the other counterclockwise. Other oddities of the VTA’s performance have been reported. The device is known to have stopped working one day after an earthquake. Though it was not substantial enough to disrupt the VTA’s set-up, it is believed that the earthquake’s accompanying electromagnetic pulse interfered with the machine. Also, when Sweet left his device on for 24 hours a day, he noticed that at night there was less voltage measured and the lights it powered were dim, while in the daytime there was more voltage and the lights were bright. Obviously, there is still a lot to learn about this new source of energy. Sweet’s VTA unit is listed as an over-unity device in the database of the Institute for New Energy (INE). The unit was tested by Tom Bearden on April 30, 1987, in front of multiple witnesses, and its most recent demonstration occurred in the 1990s. According to its own guidelines, INE rates the invention at the highest interest level, with the potential for “new physics and great impact.” INE also believes that “the device seems to be scalable to a larger size.” INE ranks the commercial aspects of Floyd Sweet’s VTA unit as very high since “the operation techniques and measurements are being refined.” Bearden vouches for the validity of his colleague’s invention, which can produce 500 watts of electricity with only a 330-microwatt input. Like many other inventors, Floyd Sweet ran into problems with threats and theft. Two Australians once offered their help to Sweet and then stole his work notebook. Upon asking John Bedini for help in understanding the notebook’s contents in order to replicate the device, Bedini noticed it was Sweet’s property and refused to cooperate. Sweet never recovered the notebook. The inventor also received death threats, over the phone and face to face. Reportedly, a well-dressed man wearing a very expensive suit and shoes approached Floyd on the street he lived on. He introduced himself as Cecil Brown, showed him a picture of Sweet inside his apartment, and said that he represented people who did not want Sweet’s invention to be revealed to the public. The man then said “that sometimes unfortunate things happen to people who do not comply with the wishes of others,” and walked away. The VTA is not without problems. Although it is capable of producing “in excess of one KW of 120 VRMS 60 HZ power,” the latest VTA prototype “has not shown the ability to continue operation for extended periods of time.” It is thought that electrical disturbances outside the device are responsible for disrupting the internal resonance. The device often fails altogether to produce a steady output, as it is common for the voltage to drop to zero within only seconds or minutes. It is not yet known how or if this problem can be solved. The joint aliens/government base known as dulce uses magnetics for EVERYTHING! They use magnetics as the basic structure for their energy source. A reel Tesla world. Tesla was the world’s greatest inventor and include free energy from space. His inventions were stolen, boycotted by the big electric and the telegraph companies, by the banks and finally poisoned. The more you learn about magnetics, the better. The Human Race calls them ‘magnets’, the Aliens call them ‘lodestar’. They have been harvesting lodestars [lodestones] for centuries. Not only that, they want ALL the magnetic power on Earth. The magnets are used to pull energy out of the vacuum and work as an aerial. They intend to continue harvesting that power, now and in the future. As long as we were only using magnetic power as an oddity, there was no problem. But in recent times, the human race has begun using magnetic power and finding more ways to utilize that commodity. There was a treaty made. In the original treaty, the human race (or those who supposedly ‘represented’ the human race, if you could call As people searched for another source for power, we turned to magnetics. The aliens wanted a new treaty.